I’ll never be able to sing “Sleigh Ride” again! Ever! Not even with Amy Grant. 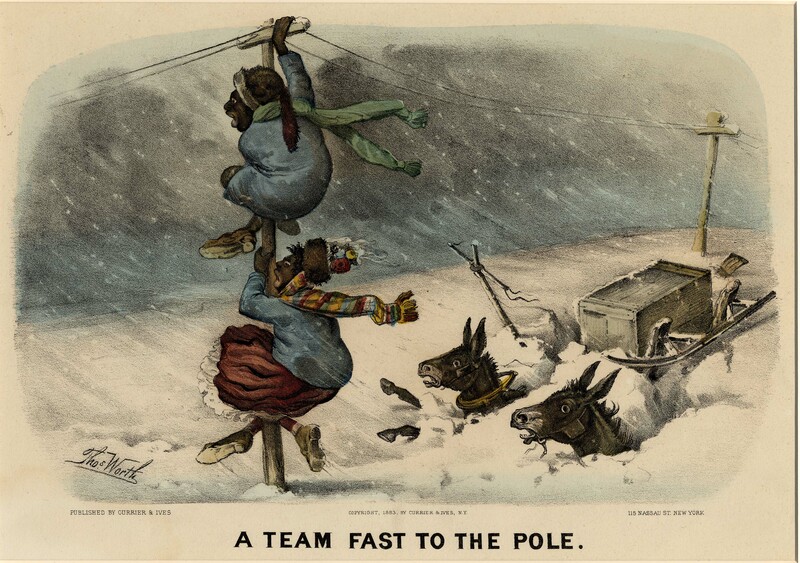 Currier & Ives!? Puh-lease! I’ll take Norman Rockwell any day. ANY day. In 1857, Nathaniel Currier, a Massachusetts lithographer, and James Merritt Ives, a self-trained artist and bookkeeper for the business of N. Currier, formed a partnership. The result was the firm of Currier & Ives, which produced three to four prints every week for fifty years – a total of over 7,500 titles. The lithographs produced by the company were published by Currier & Ives, none were actually drawn or lithographed by them. Upon their deaths in 1888 and 1895 respectively, their sons, Edward West Currier and Chauncy Ives, directed the firm until its close in 1907 (American Historical Print Collectors Society). 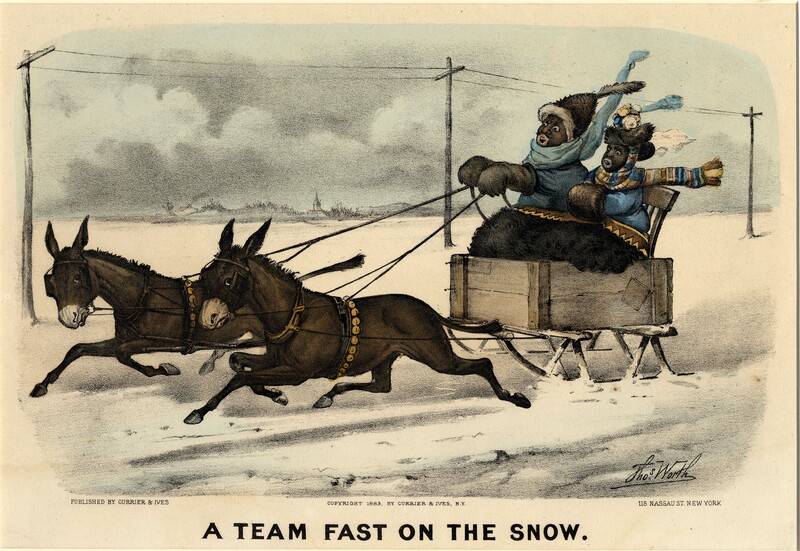 Previous to the Emancipation Proclamation, Currier & Ives generally depicted blacks as individuals content with their lives and position in society; they were often pictured in the background of idyllic plantation images. Initially after the Proclamation was issued, the firm continued to depict blacks in a positive light, focusing more on individuals, publishing portraits of John Brown, Frederick Douglas, and black Union soldiers fighting for their freedom (222). As time went on, however, and the freedmen began to move north into the cities, it became more apparent that not all Northerners were unanimous in their support of emancipation and the status of the freedman. The political images published by Currier & Ives during this time were vicious attacks against the character and intelligence of blacks, depicting them as unsupportive and disobliging of the political figures who sought to free them, such as Abraham Lincoln, Horace Greeley, and Senator Charles Sumner (226). 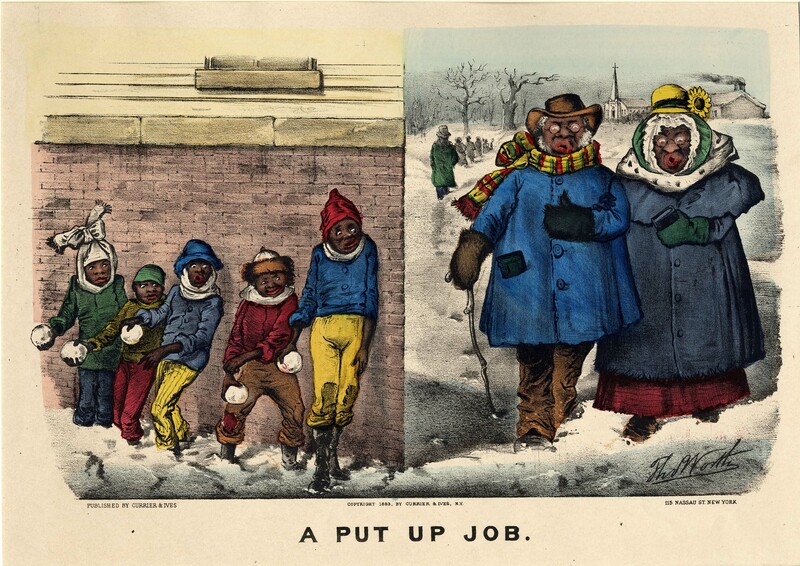 During and after Reconstruction, Currier & Ives, and America it seems, continued to appreciate these negative images of African Americans. 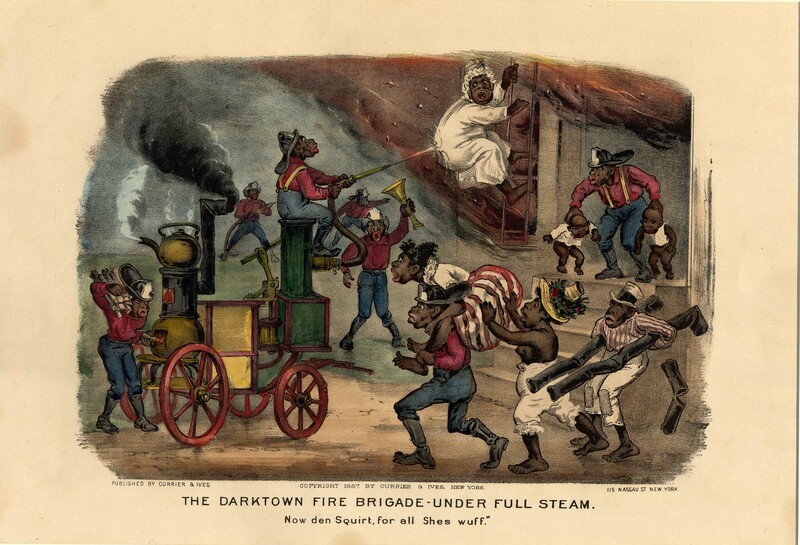 Out of this, between the mid-1870s to the early 1890s, the Darktown Comics arose, mostly illustrated by Thomas Worth (1834-1917) and James Cameron (1828-1963). The company described the Comics as “pleasant and humorous designs, free from coarseness or vulgarity, being good natured hits at the popular amusements and excitements of the times”. 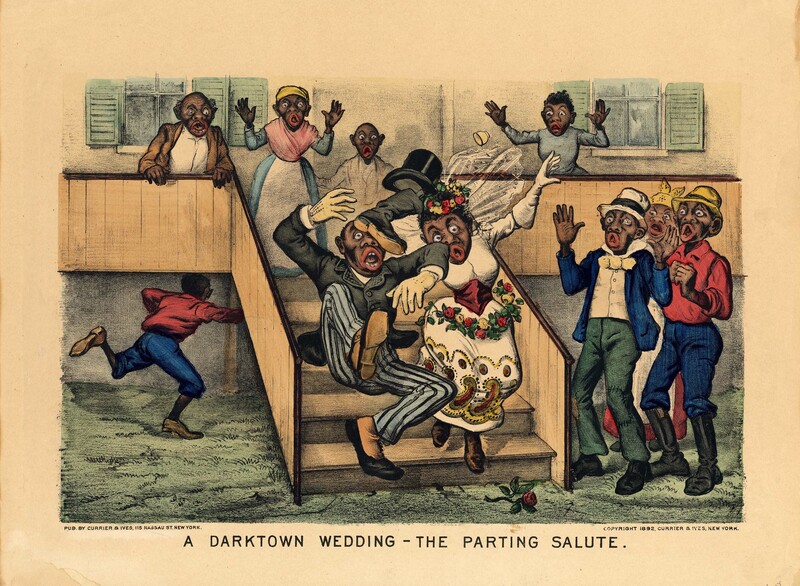 It has been suggested that Darktown may have “served as satires on polite white behavior as well”, as could be supported by previously positive images of African Americans. 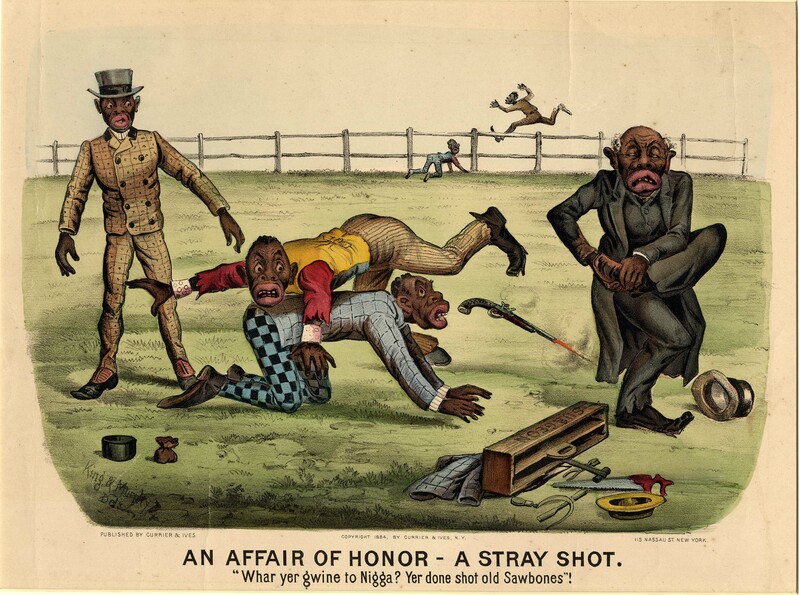 Regardless of intent, the prints only reinforced negative racial stereotypes throughout the country. 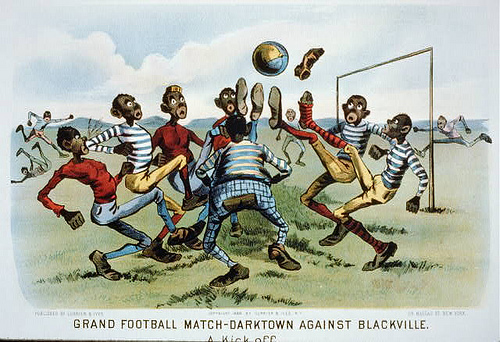 The caricatures presented by the Darktown Comics consisted of “African Americans performing actions that were more or less normal for ‘ordinary’ folk, meaning whites…the implication being that the African Americans could not execute even the simplest tasks of everyday life without making themselves appear ridiculous”. 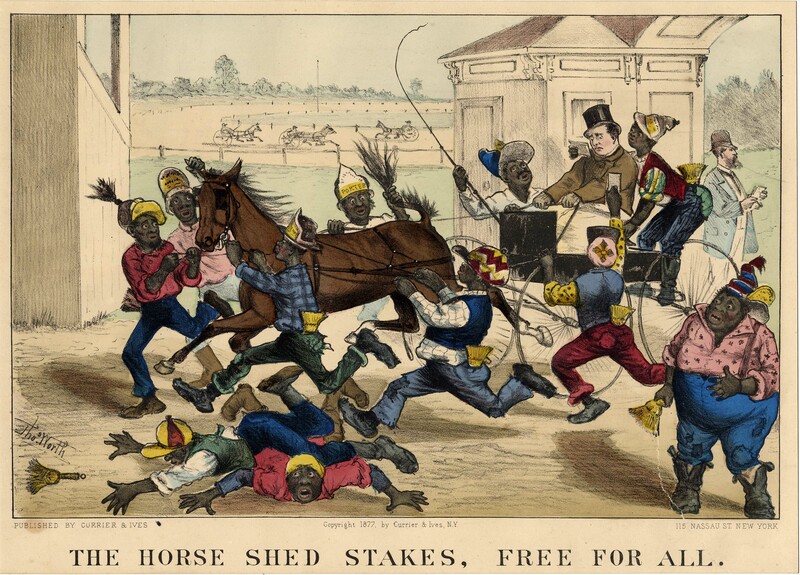 The most common images depicted by Currier & Ives’ artists were of African Americans attempting to have horse, skull, and sulky races; ride in carriages and yachts; hunt; host lawn parties; play tennis; and fight fires–always with disastrous results. And the depiction of African American lawyers, doctors and the clergymen as bumbling and dishonest were quite malicious. African American children were also featured in a poor light – as mischievous, out of control, disrespectful hoodlums. This is evident in prints by Thomas Worth such as “A Put Up Job” and “A Fall from Grace” (1883) and “Breaking In: A Black Imposition” and “Breaking Out: A Lively Scrimmage” (1881). African American stereotypes that still exist today were begun here – the connection of African Americans to music, in Darktown specifically of banjo playing, and of their supposed eating habits, most notable in the Comics, that of eating watermelon. This can be seen in the prints that make up the set of the Darktown Banjo Class and in single prints like “O Dat Watermillion!”. 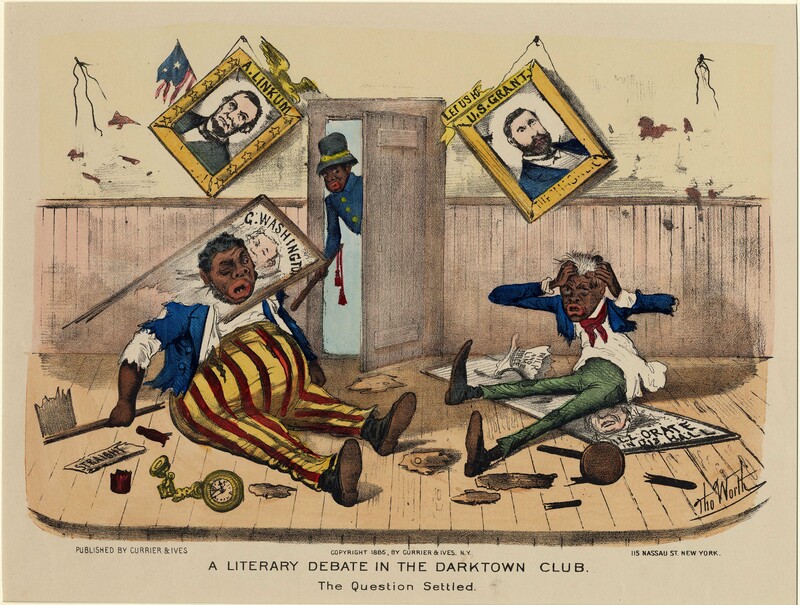 As one can see, African American speech was attacked as well, through phonetic renderings steeped in the distortion of stereotypes and caricature. The Darktown Comics did not develop or exist in a vacuum, however. In addition to theDarktown prints that came out of this time, Harper’s Weekly featured the Blackville prints; examples of which can be seen at HarpWeek’s exhibition, “Toward Racial Equality:Harper’s Weekly Reports on Black America, 1857-1874“ or the Philadelphia Print Shop’s“Blackville Prints.” These were similar in content to Darktown—spoofs of African American attempts at high fashion, sports, etc. The most prevalent artists of this series were Sol Eytinge, Jr., William Ludwell Sheppard, S.C. McCutcheon and “Sphinx” (Philadelphia Print Shop, Ltd.). Other publications, such as Life, Puck and Judge, as well as Pulitzer’s New York World and Hearst’s New York Journal produced similar images but these were in the context of satire (Hays). 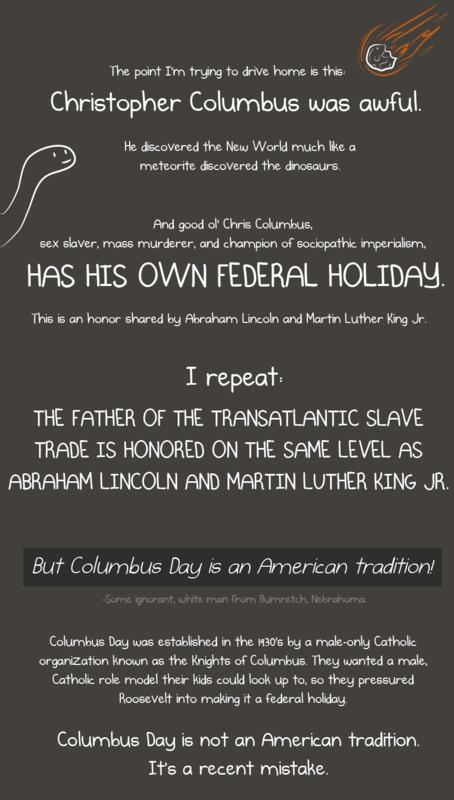 Whether or not these images were taken as satire or at face value by the American populous is up for debate, however. Other news and editorial magazines, such as The Outlook and The Independent, also promoted these types of images through their illustrations and advertising—exemplifying the prevalence and acceptance of these racist stereotypes across the country (Hays). The “high art” of this time, specifically that of southern artists, furthered these stereotypes as well, dehumanizing the African American through their depictions of coal black skin, thick red lips, oversized teeth, and patchwork clothing. It wasn’t until the impact of the Ashcan Society and the period of realism came into play that classical forms of art began to celebrate the figure of the African American as he really appeared. The art of Robert Henry, George Luks, and George Wesley Bellows are forefathers of this new view – a celebration of the African American. Today is Amy Grant’s birthday. I won’t be baking her a cake today as I did in my youth, but I thought I’d post this Amy anecdote that I came across while surfing the internets. The excerpt is a retelling of a bit from a recent Lewis Black stand-up routine found here. Happy Birthday, Amy! Last night, Black told a story that lasts about 10 minutes. 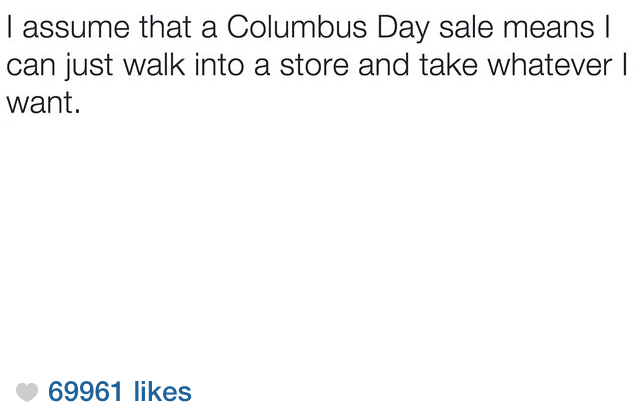 By the 10th minute, the audience response was a tidal wave of laughter. Gill opened his 30-minute set with a song. Gill then told a story. Gill then brought out his wife. Gill then sang a song inspired by his father. With the troops roaring, Gill and Grant finally left the stage. For me, this is long overdue. I’m not sure why I’ve been keeping my love for Amy Grant a secret on this blog. Maybe I thought it unnecessary what with the mulatto diaries vlog #72 thanking God for Amy Grant through tears and laughter. It just doesn’t seem right though. The obsession has faded, the nostalgia and admiration remain. The blog seems incomplete without some sort of acknowledgement. So here it is. This is trust: doing what you believe you are called to do and trusting that God will provide. But here’s where it gets personal: God provides through people. Am I willing to be connected to the people in my world, the people at work, the people in my house, the people I encounter in everyday patterns of living? Am I open to the possibility of my life, my gifts, touching another life? My life touching another, the domino effect of God’s goodness rippling through so many other lives, is a powerful, far-reaching concept. You can still cut loose and have a great time, but part of you has to say, “I will take life with open eyes and a thinking mind, and not as self-centered as I was as a child”. When you start looking at life that way you realize that issues on every level on every continent do have an effect on your life. If you went to your closet today, would you pull out the same outfit you wore 10 or 15 years ago? You wear feelings and faith differently as well. You do your best, you do all this stuff, but the only thing that counts is faith expressing itself through love. I think that if my kids are completely convinced of God`s unfailing love for them, whether they fail or not, they`ll have confidence to persevere in life. To me, the human experience does involve a great deal of anguish. It’s joyful, but it’s bittersweet. I just think that’s life. Without black, no color has any depth. But if you mix black with everything, suddenly there`s shadow – no, not just shadow, but fullness. You`ve got to be willing to mix black into your palette if you want to create something that`s real. There’s a beauty to wisdom and experience that cannot be faked. It`s impossible to be mature without having lived. Ok, so I spent a LOT of time looking at pictures of Amy Grant on the internet for this. Unfortunately most of my old favs were taken before the days of digital photography, so most of them could not be found. Those that I did find were scanned or photos of photos. I just have to put a few up anyway because most of my wardrobe in the early 90’s was purchased in an attempt to be just like Amy Grant. Looking at these pics answered a few personal “what was I thinking!”‘s. I was first intrigued by this article because I once had dreams of going to Amy Grant’s alma mater, Vanderbilt University. Then I got to the “biracial factor” at the end and I knew I had to post it. I’m encouraged that this program has garnered such interested and seems to truly be seeking open and HONEST dialogue. “Mandatory honesty.” I like that. I don’t know an institution can mandate honesty, but it’s a great idea! And I think it’s also important to remember that once talking about race was considered racist. I’ve totally been accused. Prevailing social wisdom says race, politics and religion don’t make for civil conversation. But this year, for the first time, the Scarritt-Bennett Center had a waiting list of people who want to participate in its multi-week group dialogues on race in America. The program, dubbed Diversity in Dialogue, is one of two small local groups that meet over a six-week period to foster discussion and understanding of various hot-button topics. The conversations are led by group facilitators trained by Scarritt-Bennett. They lay out a series of ground rules that include only one person speaking at a time, mandatory honesty, and what’s said in the circle stays in the circle unless specific permission to share is granted. The 2008 election of Barack Obama, the nation’s first African-American president, has led to many conversations behind closed doors about race, its meaning and its impact, said Tony Brown, a Vanderbilt University sociologist who specializes in social psychology, as well as racial and ethnic relations. “There was in some circles so much regret that (Obama) was elected and fear about what sort of change this moment represents. Then, there is so much joy,” Brown said. But having honest conversations about race isn’t easy or simple in a country where terms like “post-racial” are being thrown around after a long period in which talking about race was itself considered racist, Brown said. Swader says she is hoping to emerge from the six-week, two-hour sessions with a better understanding of the way that people think about biracial individuals — why there is a persistent demand for biracial individuals to identify as one race or another. Swader says she arrived at the group’s first session last week with the assumption that the group of people who voluntarily came together to discuss race would be almost completely black. Instead she found what she described as a good mix of people younger and older, black and white. The latest circle formed includes six black participants and eight white.